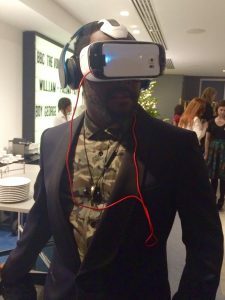 Virtual reality and the world of immersive video is the latest place where we’re seeing the convergence of new technologies with new forms of storytelling. It is a fascinating, nascent and constantly evolving space which we explored in depth on BBC Taster throughout 2016 & which I blogged about for the BBC. As the BBC had no browser based 360 solution much of the initial learning we did was on Facebook & You Tube. These stretched from putting 360 rigs into set piece productions like “Strictly Come Dancing” & The Voice to more evolved and complicated productions. In the summer of 2016 we partnered with BBC Sport, the IOC & Next VR to launch an experimental 360 service for the Rio Olympics. Available on a bespoke BBC Sport 360 App and on You Tube the content was picked up by the press but was mostly underwhelming in terms of performance and overall quality. The lessons were learnt & the next pilots were pursued with TV teams taking responsibility for their own 360 production. (in Rio, Next VR produced their work independently from the TV coverage). The BBC Live Events team brought in agency Visualise to work alongside them, creating a 360 experience to augment their BBC 1 coverage of “Trooping the Colour”. Audiences had the Queen’s eye view of the event by placing a rig on the Queen’s Daius at her eye height, for the dress rehearsal one week before the event itself. This also allowed for an important bespoke audio recording from Huw Edwards which could direct users around the experience. Taster closed 2016 by collaborating with the Greater London Authority & the BBC’s Live Events Team to produce live 360 coverage of London’s New Year’s Eve Fireworks display. On You Tube it has now had just over a million views and on Facebook has had a consolidated reach of 5.7 million with 61% of the audience under the age of 34.